I'd be interested. I'll throw out a price, $20 a pair seem fair? i definitely would order 2 pairs if they are aluminum. I agree. Aluminum would be the way to go, as the original parts on the car were plastic and were not known to last. I found a pair of NOS cups and lent one to a friend of my son who's a very good machinist and he was going to make a master set in aluminum. But he lost the one I lent him and I will not give him the second one in case he looses that one as well. I would order 2 sets if they were aluminum as well. I have the aluminum pin cups. I wonder if I could have someone make them. If there is enough interest, I would sell them here. Years ago I toyed with liquid plastic molding. Essentially you take a something or another and submerge it in a very strechy liquid rubber. 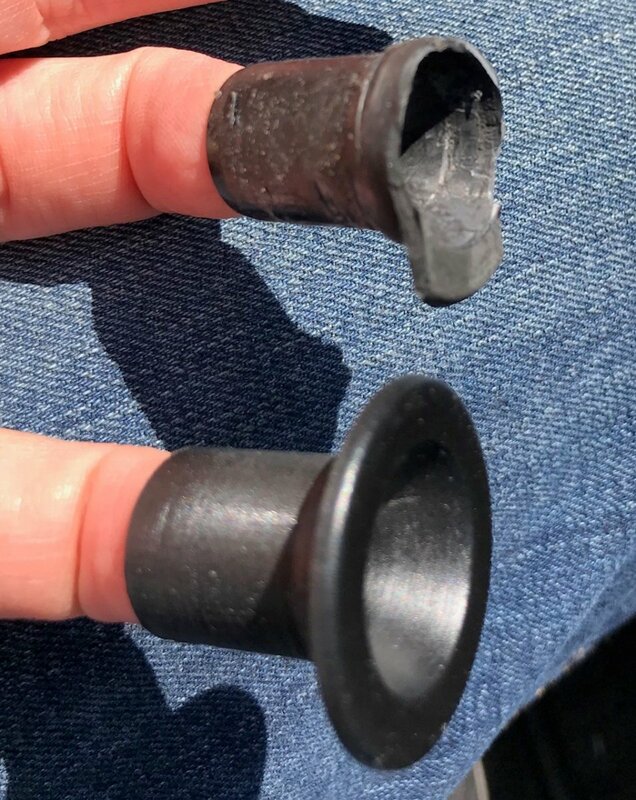 After the rubber dries you pop it out and pour plastic in. The plastic and rubber come in different grades of durability, most of which are far superior to what we had in the early 90s. This stuff is not expensive either. I'll buy a set. Aluminum, plastic, steel, wood, rubber, scrimshaw, I don't care as long as they fit, mine isn't a show car. Currently I just have the original broken plastic pieces wrapped in duct tape and jammed back in the hole in the header. I could engineer a better solution, but I've got so many other projects going on I'd rather just let someone else figure it out and pay them. I would prefer an easy replacement, something I could just drop in with some adhesive without having to disassemble the header. I'm very interested. See what you can do and let us know if it's doable. I'm in for a set or two. If you are interested in plastic guides, P/N 12513780, email me at Cutlass12513780@gmail.com for photos and info. Are you molding them or NOS? Yeah post some info about what you`re offering here first before PMs. Following are photos of guides I have made on a 3D printer. I do not believe there is an NOS part on the planet. How much are you selling the printed parts for? Anyone working on aluminum cups? Those would be a better solution; permanent. I would like 2 sets of the aluminum ones. This is incredible! They look amazing. I wish I knew more about 3D printing. So what are your plans going forward with these? You've done something here that can help almost every single vert owner. Nice! 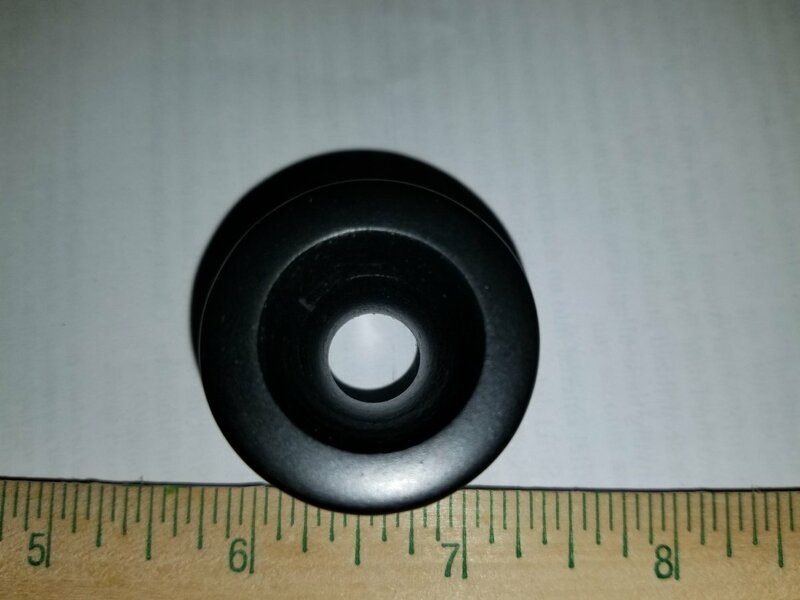 Are there different grades of plastic that can be 3D printed with? Last year we got some covers for the prop shafts on my Son's drone and they broke relatively quickly. Found this thread Memphis, I'll keep a lookout for any originals but no luck so far. 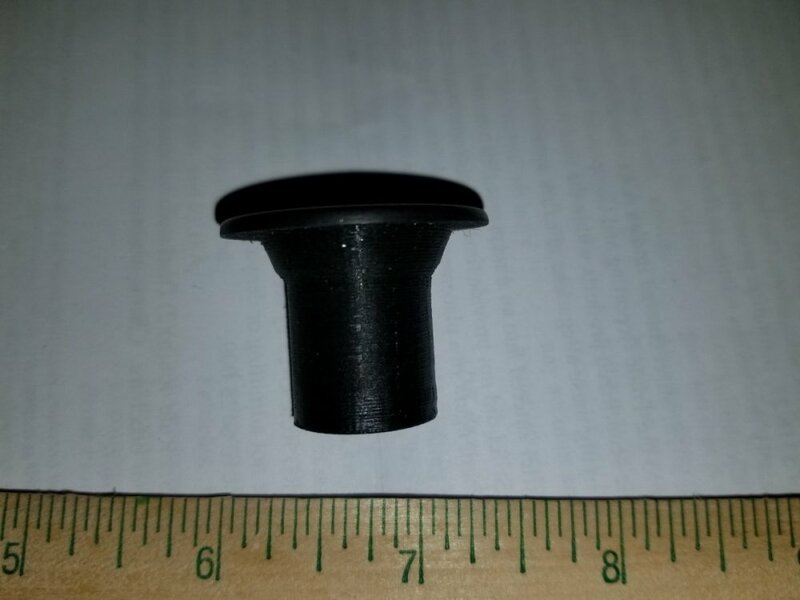 I bought a pair of the 3D printed pin cups, they look and fit great! I thought about painting them to protect the plastic from UV damage, but I'll do it later when I paint my windshield frame and sideview mirrors. The second picture is the pin cup in place. I don't have time to disassemble the header for something like this, so I just dropped them in from the top. My old snap rings had fallen off a few years ago, so my pin cups have been held in place with some double-sided tape as a temporary solution. Now that I have a replacement part, I will use some adhesive to hold them in place. Thanks again, Kzwxlf! I'll post an update here in a year or two (or sooner if they break). Update: The pin cups are still functioning well, but after less than two months the lip has started to slightly deform. 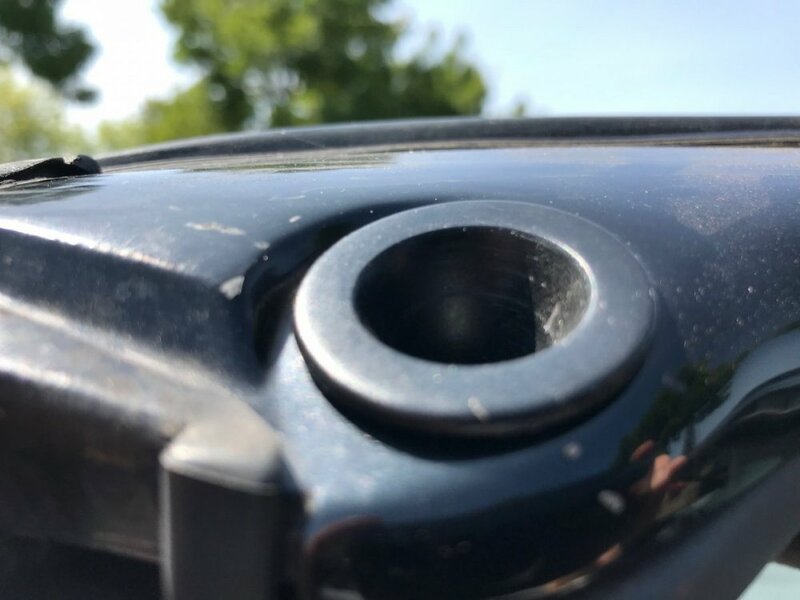 I'm not sure if it is from the direct sunlight when parked outside with the top down, compression pressure from the top header when it's closed, or if it is from a side-load pressure from the pin when it's engaged causing the lip to bend. Anyway, it's not a big problem because they still fit, do their job, look good, and haven't broken. And I know that 3D-printed plastic isn't very strong so I'm not surprised. I don't regret my purchase and I still very strongly recommend that others also buy them. I'll give another update after a few months of below-freezing temps of winter, or if I notice any more changes. Note: I did not paint them with UV-protection yet. 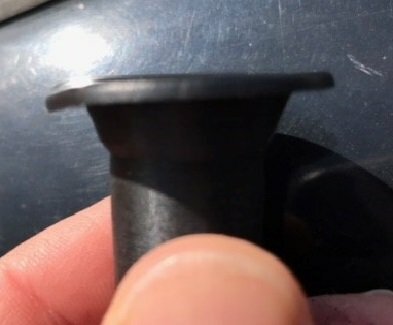 Has anyone else with these 3D-printed pin cups experienced any deformation? I emailed kzwslf, but never heard a response from him. I'd like a couple of pairs. This is the place I got my moldmaking rubber and plastic from years ago. It was easy to work with, all you need is a single good one to pull a mold from and you can reproduce infinite replacements for a few cents a piece, and in a variety of colors. There are different grades of plastics and some of them are VERY tough.